This article is about the video game. For the media franchise, see Myst (series). Not to be confused with mist. The box art shows the primary Age, Myst Island. Myst is a graphic adventure puzzle video game designed by the Miller brothers, Robyn and Rand. It was developed by Cyan, Inc., published by Brøderbund, and released as a PC game for the Macintosh platform in 1993. In the game, players are told that a special book has caused them to travel to Myst Island. There, players solve puzzles and, by doing so, travel to four other worlds, known as Ages, which reveal the backstory of the game's characters. After the development of several games aimed at children, the Miller brothers conceived of Myst as a game for adults. Development began in 1991 and was Cyan's biggest undertaking to date. Technical constraints of the time influenced the design of the game and the production of its graphics, which were state-of-the-art but static. Robyn Miller ended up composing 40 minutes of synthesized music that became the soundtrack to Myst. Myst was a surprise hit, with critics lauding the ability of the game to immerse players in its fictional world. The game was the best-selling PC game for a time, until The Sims exceeded its sales in 2002. Multiple remakes and ports of the game to other platforms have been released, and Myst helped drive adoption of the then-nascent CD-ROM format. Its success not only spawned numerous ports, but sequels, remakes, and spin-off novels and media. 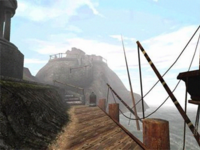 Myst's gameplay consists of a first-person journey through an interactive world. Players can interact with specific objects on some screens by clicking or dragging them. The player moves by clicking on locations shown on the screen; the scene then crossfades into another frame, and the player can explore the new area. Myst has an optional "Zip" feature to assist in rapidly crossing areas already explored; when a lightning bolt cursor appears, players can click and skip several frames to another location. While this provides a rapid method of travel, it can also cause players to miss important items and clues. Some items can be carried by the player and read, including journal pages which provide backstory. Players can only carry a single page at a time, and pages return to their original locations when dropped. To complete the game, the player must explore the island of Myst. There the player discovers and follows clues to be transported via "linking books" to several "Ages", each of which is a self-contained mini-world. Each of the Ages—named Selenitic, Stoneship, Mechanical, and Channelwood—requires the user to solve a series of logical, interrelated puzzles to complete its exploration. Objects and information discovered in one Age may be required to solve puzzles in another Age, or to complete the game's primary puzzle on Myst. For example, in order to activate a switch, players must first discover a combination to a safe, open it, and use the matches found within to start a boiler. Apart from its predominantly nonverbal storytelling, Myst's gameplay is unusual among adventuring computer games in several ways. The player is provided with very little backstory at the beginning of the game, and no obvious goals or objectives are laid out. This means that players must simply begin to explore. There are no obvious enemies, no physical violence, no time limit to complete the game, and no threat of dying at any point. The game unfolds at its own pace and is solved through a combination of patience, observation, and logical thinking. Players assume the role of an unnamed person who stumbles across an unusual book titled "Myst". The player reads the book and discovers a detailed description of an island world called Myst. Placing his or her hand on the last page, the player is whisked away to the world described and is left with no choice but to explore the island. Myst contains a library where two additional books can be found, colored red and blue. These books are traps that hold Sirrus and Achenar, the sons of Atrus, who once lived on Myst island with his wife Catherine. Atrus writes special "linking books" that transport people to the worlds, or "Ages", that the books describe. From the panels of their books, Sirrus and Achenar tell the player that Atrus is dead; each brother blames the other for the death of their father, as well as the destruction of much of Atrus' library. Both plead for help to escape. The books are missing several pages, rendering the sons' messages unclear and riddled with static. As the player continues to explore the island, books linking to more Ages are discovered hidden behind complex mechanisms and puzzles. The player must visit each Age, find the red and blue pages hidden there, and return to Myst Island. These pages can then be placed in the corresponding books. As the player adds more pages to these books, the brothers can be seen and heard more clearly. After collecting four pages, the brothers can talk clearly enough to tell the player where the fifth and final missing page for their book is hidden; if the player can complete either book, that brother will be set free. The clearer dialog also allows the player to more accurately judge each brother's personality. The player is left with a choice to help Sirrus, Achenar, or neither. Sirrus and Achenar beg the player not to touch the green book that is stored in the same location as their final pages, claiming it to be another trap book like their own. In truth, it leads to D'ni, where Atrus is imprisoned. When the book is opened, Atrus asks the player to bring him a final page that is hidden on Myst Island; without it, he cannot bring his sons to justice. The game has several endings, depending on the player's actions. Giving either Sirrus or Achenar the final page of their book causes the player to switch places with the son, leaving the player trapped inside the Prison book. Linking to D'ni without the page Atrus asks for leaves the player and Atrus trapped on D'ni. Linking to D'ni with the page allows Atrus to complete his Myst book and return to the island. Upon returning to the library, the player finds the red and blue books gone, and burn marks on the shelves where they used to be. We started our design work and realized that we would need to have even more story and history than would be revealed in the game itself. It seemed having that depth was just as important as what the explorer would actually see. In 1988, brothers Rand and Robyn Miller were living apart in the United States. Robyn was taking a year off from university, writing and trying to establish state residency. Rand was a computer programmer for a bank. Rand approached his brother with the idea of making an interactive storybook using HyperCard. The brothers were not big video game players themselves, although they were familiar with Dungeons & Dragons, and had played Zork. In his parents' basement—Robyn did not own a computer himself—Robyn began drawing pictures and creating a nonlinear story that would eventually become their first game, The Manhole. The Manhole and the games that followed—Cosmic Osmo and Spelunx—were specifically aimed at children and shared the same aesthetics: black-and-white graphics, point-and-click gameplay, a first-person point of view, and explorable worlds. Robyn recalled that the games were more about exploration than narrative: "In the projects we did for children, we didn't really tell stories ... They were just these worlds that you would explore." Around 1990, the brothers decided to create a game that would appeal to adults. Among their goals were believable characters, a non-linear story, and for the player as protagonist to make ethical choices. The Millers pitched the game to Activision under the title The Gray Summons; Robyn recalled that Activision told them to stick to children's games. At the time of the rejection, they were not doing well financially—"we were eating rice and beans and government cheese and that [was] our diet." Facing the end of their game-producing career, Sunsoft approached the Millers to create an adult-oriented game. Like with The Gray Summons, the Millers wanted their game to have a non-linear story with believable characters and an ethical choice. They also wanted to produce a game with far more impressive graphics than their previous efforts—at one point they considered making the game entirely hand-drawn. Finally, they knew their story would be a mystery. Development of Myst began in 1991. The game's creative team consisted of brothers Rand and Robyn, with help from sound designer Chris Brandkamp, 3D artist and animator Chuck Carter, Richard Watson, Bonnie McDowall, and Ryan Miller, who together made up Cyan, Inc. Myst was the largest and most time-consuming collaboration Cyan had attempted at that point. Cyan took inspiration from games like Zork, Star Wars' mythic universe, portals to other worlds like in C. S. Lewis' The Chronicles of Narnia, and the mysterious islands of old literature like the works of Jules Verne. The game's name, as well as the overall solitary and mysterious atmosphere of the island, was inspired by the book The Mysterious Island by Verne. Sunsoft was not interested in the game for PC and was instead focused on the video game console market. At the time, consoles had no hard drives and small memory buffers, meaning the game had to be designed around these technical constraints. To solve this issue, they compartmentalized parts of the game's environments into the different Ages. The Millers decided that most people did not like puzzles. Thus, a good puzzle would feel familiar and part of the world—not like a puzzle, but something for players to figure out like a circuit breaker in their house, using observation and common sense. Cyan did not have fans to please, and did not know exactly who the game would appeal to; Robyn felt like they did not have to second-guess their choices and could "explore the world as we were designing" and build a game for themselves. In a 2016 interview, Rand Miller stated that they strived to design the puzzles in Myst and their subsequent games by trying to balance three aspects: the puzzles themselves, the environment, and the story. Rand also stated they wanted to make sure that clues to the solutions to puzzles were apparent and presented to the player in a manner for these connections to be made: "once the player finds the solution, if they blame us, then we haven't done a good job. But if they blame themselves, then we have." Cyan proposed Myst to Sunsoft for $265,000—more than double what they thought it would cost to develop the game, but ultimately less than Myst cost to produce. After getting the go-ahead, Cyan playtested the entire game in a role-played Dungeons and Dragons form to identify any large issues before entering full production. Macintosh computers like this one were used to develop Myst. Slow single-speed CD-ROM drives and game console memory limitations proved to be major technical constraints. Myst was not only the largest collaboration Cyan had attempted at the time, but also took the longest to develop. According to Rand Miller, the brothers spent months solely designing the look and puzzles of the Ages, which were influenced by earlier whimsical "worlds" made for children. Much of the early development time was spent devising puzzles and the Ages, and the story was secondary. "We were place designers ... and the maps kind of fueled the story," Rand said. The plot evolved in tandem with the changing environment, developing new story details with each new building in the world. The climactic ending with Atrus was a later development in the game's story after Cyan realized they wanted to create a more complicated ending. In retrospect, Robyn felt that Myst did not quite provoke the emotional reaction and ethical quandary they set out to create. When Cyan began development, developing believable characters was a major hurdle. The brothers were limited to one-way communication with the player, and at any point, a player could choose to walk away and "break the spell" of the game. Displaying video in the game was initially infeasible. Designing around the limits, the designers created the trap books, which were location-specific, one-way communication devices. The release of QuickTime halfway through development of the game solved the video issue. At first, the developers had no idea how they would actually create the physical terrain for the Ages. Eventually, they created grayscale heightmaps, extruding them to create changes in elevation. From this basic terrain, textures were painted onto a colormap which was wrapped around the landscapes. Objects such as trees were added to complete the design. Rand noted that attention to detail allowed Myst to deal with the limitations of CD-ROM drives and graphics, stating "A lot can be done with texture ... Like finding an interesting texture you can map into the tapestry on the wall, spending a little extra time to actually put the bumps on the tapestry, putting screws in things. These are the things you don't necessarily notice, but if they weren't there, would flag to your subconscious that this is fake." The game was created on Macintosh computers, principally Macintosh Quadras. The graphics were individual shots of fully rendered rooms. Overall, Myst contains 2,500 frames, one for each possible area the player can explore. Each scene was modeled and rendered in StrataVision 3D, with some additional modeling in Macromedia MacroModel. The images were then edited and enhanced using Photoshop 1.0. The original Macintosh version of Myst was constructed in HyperCard. Each Age was a unique HyperCard stack. Navigation was handled by the internal button system and HyperTalk scripts, with image and QuickTime movie display passed off to various plugins; essentially, Myst functions as a series of separate multimedia slides linked together by commands. As the main technical constraint that impacted Myst was slow CD-ROM drive read speeds, Cyan had to go to great lengths to make sure all the game elements loaded as quickly as possible. Images were stored as 8-bit PICT resources with custom color palettes and QuickTime still image compression. Animated elements such as movies and object animations were encoded as QuickTime movies with Cinepak compression; in total, there were more than 66 minutes of Quicktime animation. This careful processing made the finished graphics look like truecolor images despite their low bit depth; the stills were reduced in size from 500 KB to around 80 KB. Cyan playtested the game with two people sitting in front of the game, finding that they would converse with each other and vocalize their likes and dislikes compared to one person silently playing. Rand and Robyn sat behind the testers taking notes, and could make on-the-fly changes and fixes. Cyan wanted the interface of the game to be invisible, and to craft a game that all kinds of people would enjoy. Early on they had decided that there would be no inventory, enemies, or ways to die; eventually, they included a save system as a concession to the fact that it would take most players months to complete the game. Among the problems testers discovered with the story was that Myst initially had no inciting incident. In response, Cyan added a note from Atrus to Catherine that clued players into the existence of a chamber by the dock that played a message from Atrus and explained the game's objectives. Chris Brandkamp produced most of the ambient and incidental sounds in the game. To make sure the sounds fit, Brandkamp had to wait until the game's visuals were placed in context. Sound effects were drawn from unlikely sources; the noise of a fire in a boiler was created by driving slowly over stones in a driveway because recordings of actual fire did not sound like fire burning. The chimes of a large clock tower were simulated using a wrench, then transposed to a lower pitch. At first, Myst had no music, because the Millers did not want music to interfere with the gameplay. After a few tests, they realized that the background music did not adversely affect the game and, in fact, "seemed to really help the mood of certain places that you were at in the game." Robyn Miller ended up composing 40 minutes of synthesized music that was used in the game and later published as Myst: The Soundtrack. Mixing and effects were done on an E-mu Proteus MPS synthesizer. The soundtrack was recorded over the course of two weeks' evenings. Initially, Cyan released the soundtrack via a mail-order service, but before the release of Myst's sequel, Riven, Virgin Records acquired the rights to release the soundtrack, and the CD was re-released on April 21, 1998. The PC version of Myst holds an average score of 83% at GameRankings based on 7 reviews, although the subsequent remakes of the game and the console ports have generally received lower average scores. Myst was generally praised by critics. Computer Gaming World assured its readers that the game was not like other CD-ROM games that were "high on glitz and low on substance ... Myst is everything it's touted to be and is, quite simply, the best [Macintosh] CD-ROM game". It praised the game's open-world nature, lack of death, and "straightforward and simple" storyline. The magazine stated that the "mesmerizing" and "stunning" graphics and sound were "not the star of the show ... the substance of the game is every bit as good as its packaging", and concluded that Myst "is bound to set a new standard". In April 1994, the magazine called it an "artistic masterwork". Wired and The New York Times were among the publications that pointed to Myst as evidence that video games could, in fact, evolve into an art form. Entertainment Weekly reported that some players considered Myst's "virtual morality" a religious experience. Aarhus University professor Søren Pold pointed to Myst as an excellent example of how stories can be told using objects rather than people. Laura Evenson, writing for the San Francisco Chronicle, pointed to adult-oriented games like Myst as evidence the video game industry was emerging from its "adolescent" phase. GameSpot's Jeff Sengstack wrote that "Myst is an immersive experience that draws you in and won't let you go." Writing about Myst's reception, Greg M. Smith noted that Myst had become a hit and was regarded as incredibly immersive despite most closely resembling "the hoary technology of the slideshow (with accompanying music and effects)". Smith concluded that "Myst's primary brilliance lies in the way it provides narrative justification for the very things that are most annoying" about the technological constraints imposed on the game; for instance, Macworld praised Myst's designers for overcoming the occasionally debilitating slowness of CD drives to deliver a consistent experience throughout the game. The publication went on to declare Myst the best game of 1994, stating that Myst removed the "most annoying parts of adventure games — vocabularies that [you] don't understand, people you can't talk to, wrong moves that get you killed and make you start over. You try to unravel the enigma of the island by exploring the island, but there's no time pressure to distract you, no arbitrary punishments put in your way". Some aspects of the game still received criticism. Several publications did not agree with the positive reception of the story; Jeremy Parish of 1UP.com noted that while Myst's lack of interaction and continual plot suited the game, it helped usher in the death of the adventure game genre. Edge stated the main flaw with the game was that the game engine was nowhere near as sophisticated as the graphics. Heidi Fournier of Adventure Gamers noted a few critics complained about the difficulty and lack of context of the puzzles, while others believed these elements added to the gameplay. Similarly, critics were split on whether the lack of a plot the player could actually change was a good or bad element. In 1996 Next Generation called it "gaming's bleakest hour", saying the static graphics and purely trial-and-error puzzles epitomized poor game design. They said Myst's commercial success, which they owed chiefly to its popularity among non-gamers as a CD-ROM showcase, had led to many other games emulating its negative aspects. In a 2000 retrospective review, IGN declared that Myst had not aged well and that playing it "was like watching hit TV shows from the 70s. 'People watched that?,' you wonder in horror." Myst was named Best Adventure/Fantasy Role-Playing Game at the 1994 Codie awards, and received an honorable mention in Electronic Entertainment's 1993 "Breakthrough Game" category, which ultimately went to The 7th Guest. That magazine's editors wrote, "One of the best-looking, best-sounding games ever, the Macintosh version of Myst sets new standards for the effective use of CD-ROM." Myst was also a runner-up for Computer Gaming World's 1993 "Adventure Game of the Year" award, but lost to Gabriel Knight: Sins of the Fathers and Day of the Tentacle (tie). In 1996, the magazine ranked Myst 11th on its list of the most innovative computer games. Reviews for the game's console ports generally reflected each critic's attitude towards the original game, as critics agreed that the ports for 3DO, Saturn, and PlayStation are virtually identical to the PC original. For example, Sushi-X of Electronic Gaming Monthly gave the 3DO version a 5 out of 10, remarking "The graphics and sounds are decent but the game never really appealed to me on the PC", while his co-reviewer Danyon Carpenter gave it a 7 out of 10 and assessed that "This game was all the rage when it debuted on the PC, and that excitement should follow through on the 3DO." In one of the more enthusiastic reviews for Myst, GamePro gave the 3DO version a perfect 5 out of 5 in all four categories (graphics, sound, control, and funfactor), concluding, "Beautiful and enchanting, Myst will thrill you and make you think at the same time." The Jaguar CD version was largely ignored by reviewers, but GamePro commented that apart from the Jaguar CD's lack of a mouse peripheral and occasionally longer load times, this version too is identical to the PC original. However, the 3DS version received negative reviews even from critics who felt that Myst's popularity was merited, citing graphics and audio well below the 3DS's capabilities and the use of awkward circle pad controls in lieu of the 3DS's touchscreen. Myst was an immense commercial success. Along with The 7th Guest, it was widely regarded as a killer application that accelerated the sales of CD-ROM drives. By November 2000, it had sold above 6.3 million units worldwide, including more than 4.3 million in the United States. The game's success also led to a number of games which sought to copy Myst's success, referred to as "Myst clones". Myst was the bestselling PC game throughout the 1990s until The Sims exceeded its sales in 2002 and was the top-selling game in the US for a total of 52 months between March 1993 and April 1999. Myst's success baffled some, who wondered how a game that was seen as "little more than 'an interactive slide show'" turned out to be a hit. Some developers of adventure games concurrent to Myst's release were somewhat critical of its success due to the number of subsequent video games that copied Myst's style compared to traditional adventure games, which diluted the market with poorly-received clones and which contributed to the waning popularity of the adventure game genre by 2000. Others criticized Myst as the "ultimate anti-arcade game", as it was much more relaxed and casual than anything that was released before since 1972, since "there were no lives, no dying, no score, and no time limit. No physical agility or reflexes were required. The only pressure was that which you imposed upon yourself to solve the puzzles and complete the storyline." In addition to the numerous remakes and ports of the game, Myst's success led to several sequels. Riven was released on October 29, 1997, in which Atrus asks the player to return to help him rescue his wife from Gehn. Myst III: Exile was released simultaneously for Macintosh and Windows systems in North America on May 7, 2001, and was later ported to the PlayStation 2 and Xbox consoles. Exile was not developed by Cyan; Presto Studios developed the title and Ubisoft published it. Taking place 10 years after the events of Riven, Exile reveals the reasons for Atrus' sons being imprisoned and the disastrous effects their greed caused. The fourth entry in the series, Myst IV: Revelation, was released on September 10, 2004, and was developed and published entirely by Ubisoft. The music was composed by Jack Wall with assistance from Peter Gabriel. The final game in the Myst saga was Myst V: End of Ages, developed by Cyan Worlds and released on September 19, 2005. In addition to the main Myst saga, Cyan developed Uru: Ages Beyond Myst, which was released on November 14, 2003. Uru allows players to customize their avatars and renders graphics in real-time. The multiplayer component of Uru was initially canceled, but GameTap eventually revived it as Myst Online: Uru Live, which was in turn canceled. The game was later resurrected as an open source title. The newest and current iteration of online Uru was made open source, and various fan-made Ages have been created. In the mid 1990s the Miller brothers collaborated with David Wingrove, writing several novels based on the Myst universe, which were published by Hyperion. The novels, entitled Myst: The Book of Atrus, Myst: The Book of Ti'ana, and Myst: The Book of D'ni, fill in the games' backstory and were packaged together as The Myst Reader. By 2003, the Myst franchise had sold over twelve million copies worldwide, with Myst representing more than six million copies in the figure. The game was the best-selling PC game until The Sims exceeded its sales in 2002. Myst was added to the collection of video games of the Museum of Modern Art in 2013, where it is displayed as a video presentation. The game's popularity has led to several mentions in popular culture. References to Myst made appearances in an episode of The Simpsons ("Treehouse of Horror VI"), and Matt Damon wanted The Bourne Conspiracy video game to be a puzzle game like Myst, refusing to lend his voice talent to the game when it was turned into a shooter instead. Myst has also been used for educational and scientific purposes; Becta recognized a primary school teacher, Tim Rylands, who had made literacy gains using Myst as a teaching tool, and researchers have used the game for studies examining the effect of video games on aggression. A parody computer game, Pyst, was released in 1996; the game is a satirical free roam of Myst island which had been apparently vandalized by frustrated visitors. In retrospective, Myst is considered to be a precursor to casual games that gained popularity with browser platforms and mobile devices which typically do not require players to act quickly, as well as a preliminary example of a walking simulator that allow players to explore and discover the game's narrative at their own pace. Cyan's sequels to Myst also indirectly served to popularize escape the room games, which provide similar puzzle-solving experiences but in a much more confined space. Disney approached Cyan Worlds about constructing a theme park inspired by Myst, which included scouting an island area within Disney's Florida properties that Rand Miller felt was perfect for the Myst setting. The television streaming service Hulu has obtained the rights to create a television series around Myst in May 2015. The series would explore the origin of the main island featured in Myst. The series is being produced by Legendary Television, which had acquired the television rights from Cyan for the series in late 2014. The show will be produced by Matt Tolmach and written by Evan Daugherty. Rand Miller stated in a September 2016 interview that with the show, "we're farther along now than we've been in a long time", but timelines remain uncertain. 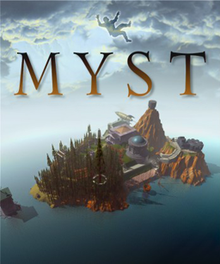 Myst's success led to the game being ported to multiple platforms, including the Saturn, PlayStation, PlayStation 3, PlayStation Portable, Android, iPhone, Nintendo 3DS, Jaguar CD, AmigaOS, CD-i, and 3DO consoles. There was also a version developed and even previewed for the Sega CD, but it was never released by Sunsoft. Myst: Masterpiece Edition was an updated version of the original Myst, released in May 2000. It featured several improvements over the original game's multimedia: the images were re-rendered in 24-bit truecolor instead of the original Myst's 256 colors (8-bit); the score was re-mastered, and sound effects were enhanced. realMyst: Interactive 3D Edition was a remake of Myst released in November 2000 for Windows PCs, and in January 2002 for Mac. Unlike Myst and the Masterpiece Edition, the gameplay of realMyst featured free-roaming, real-time 3D graphics instead of point-and-click pre-rendered stills. Weather effects like thunderstorms, sunsets, and sunrises were added to the Ages, and minor additions were made to keep the game in sync with the story of the Myst novels and sequels. The game also added a new sixth Age called Rime, which is featured in an extended ending, as well as the addition of Ti'ana's grave on Myst island. realMyst was developed by Cyan, Inc. and Sunsoft, and published by Ubisoft. While the new interactivity of the game was praised, realMyst ran poorly on most computers of the time. Robyn Miller expressed frustration with realMyst, saying: "I only saw realMyst after it was released. As a remake, it was a lapse of reason and directionless; overt merchandising of the original Myst. It definitely wasn't how we originally envisioned Myst, as was promoted." realMyst: Masterpiece Edition, a visually enhanced revision running on the Unity engine that also includes the graphics of the original Myst game, was released on Steam on February 5, 2014. The remake was updated to version 2.0 on January 28, 2015, receiving a significant graphical overhaul in which several bugs were fixed and the detail of many models and textures was upgraded. On May 18, 2012, the PlayStation Network released a port for Myst in the form of a PSone classic for the PlayStation 3 and PSP. In November 2005, Midway Games announced that they would be developing a remake of Myst for the PlayStation Portable. The remake would include additional content that was not featured in the original Myst, including the Rime age that was earlier seen in realMyst. The game was released in Japan and Europe in 2006, and the US version was released in 2008. A version of Myst for the Nintendo DS was also released in December 2007. The version features re-mastered video and audio, using source code specifically re-written for the Nintendo DS. The remake features Rime as a playable Age, with an all-new graphics set. This version of the game was released in Europe on December 7, 2007, courtesy of Midway. It was released in North America on May 13, 2008, originally published by Navarre and later reissued by Storm City Games. The version was heavily panned by the gaming press, with an aggregate score of 43/100 on Metacritic. This version was again later re-released for Nintendo 3DS, published by Funbox Media in Europe, and Maximum Family Games in North America and Australia. The game later appeared in digital format via the Nintendo eShop in North America on November 15, 2012, and in Europe on September 5, 2013. In February 2005, Cyan and Mean Hamster Software released Myst for the Microsoft Windows Mobile platform; Riven was ported shortly after. In August 2008, Cyan announced that the company was developing a version of Myst for Apple's iOS. The game was made available to download from the iTunes App Store on May 2, 2009. The original download size was 727 MB, which was considered very large by iPhone standards. An updated version of realMyst was released for iPad 2 and above, with improved graphics over the original PC release, on June 14, 2012. A version for Android devices based on the realMyst version was released on January 26, 2017, produced and published by Noodlecake, and a similar port for Riven was released on April 26, 2017. ^ "Mohawk". wiki.scummvm.org/. Archived from the original on September 6, 2016. ^ "Plasma engine". giantbomb.com. Archived from the original on June 22, 2015. ^ "Myst Studies". mystjourney.com. Archived from the original on January 13, 2017. Retrieved January 10, 2017. ^ "Cyan remakes Myst in real-time 3D—again". techreport.com/. Archived from the original on January 13, 2017. ^ Myst User Manual. "Manipulating Objects" (Windows version ed.). Brøderbund. 1993. pp. 5–6. ^ Myst User Manual. "Zip Mode" (Windows version ed.). Brøderbund. 1993. p. 9. ^ Myst User Manual. "Options Menu" (Windows version ed.). Brøderbund. 1993. p. 13. ^ a b c d Carroll, John (August 1994). "Guerrillas in the Myst". Wired. 2 (8). Archived from the original on February 9, 2011. ^ a b c d e Smith, Greg (2002). Hop on Pop: The Pleasures and Politics of Popular Culture. Navigating Myst-y Landscapes: Killer Applications and Hybrid Criticism. Duke University Press. ISBN 0-8223-2737-6. ^ Myst User Manual (Windows version ed.). Brøderbund. 1993. p. 2. ^ a b c d e f g Yoshida, Emily (September 26, 2013). "Lost to the Ages". Grantland. ESPN. Archived from the original on September 26, 2013. Retrieved September 26, 2013. ^ a b Poole, Stephen. "Myst Game Guide". GameSpot. Archived from the original on March 13, 2000. Retrieved February 8, 2009. ^ a b c Stern, Gloria (August 23, 1994). "Through the Myst". WorldVillage.com. Archived from the original on February 17, 2009. Retrieved April 27, 2014. ^ Rabin, Steve (June 2005). Introduction to game development. 1. Cengage Learning. p. 26. ISBN 1-58450-377-7. ^ a b Miller, Robyn. Classic Game Postmortem: Myst. Game Developers Conference Vault. UBM plc. Event occurs at 8'45"–12'07". Archived from the original on April 9, 2015. Retrieved February 22, 2016. ^ a b Miller, Robyn. Classic Game Postmortem: Myst. Game Developers Conference Vault. UBM plc. Event occurs at 4'30"–5'35". Archived from the original on April 9, 2015. Retrieved February 22, 2016. ^ Miller, Robyn. Classic Game Postmortem: Myst. Game Developers Conference Vault. UBM plc. Event occurs at 5'40"–8'43". Archived from the original on April 9, 2015. Retrieved February 22, 2016. ^ a b Cyan, Inc. (1993). Myst User Manual. "About the Authors" (Windows version ed.). Brøderbund. p. 15. ^ Miller, Robyn. Classic Game Postmortem: Myst. Game Developers Conference Vault. UBM plc. Event occurs at 12'15"–14'00". Archived from the original on April 9, 2015. Retrieved February 22, 2016. ^ Miller, Robyn. Classic Game Postmortem: Myst. Game Developers Conference Vault. UBM plc. Event occurs at 14'35"–16'30". Archived from the original on April 9, 2015. Retrieved February 22, 2016. ^ Miller, Robyn. Classic Game Postmortem: Myst. Game Developers Conference Vault. UBM plc. Event occurs at 16'35"–17'30". Archived from the original on April 9, 2015. Retrieved February 22, 2016. ^ a b c d Hughes, William (September 10, 2016). "Myst creator Rand Miller on his favorite puzzle that everybody hates". The A.V. Club. Archived from the original on September 13, 2016. Retrieved September 13, 2016. ^ Miller, Robyn. Classic Game Postmortem: Myst. Game Developers Conference Vault. UBM plc. Event occurs at Q&A Session. Archived from the original on April 9, 2015. Retrieved February 22, 2016. ^ Miller, Robyn. Classic Game Postmortem: Myst. Game Developers Conference Vault. UBM plc. Event occurs at 18'00"–19'20". Archived from the original on April 9, 2015. Retrieved February 22, 2016. ^ a b c d e f g h i j k l m n o Miller, Rand and Robyn; Cyan (1993). The Making of Myst (CD-ROM). Cyan, Inc./Brøderbund. ^ Miller, Robyn. Classic Game Postmortem: Myst. Game Developers Conference Vault. UBM plc. Event occurs at 25'00"–28'25". Archived from the original on April 9, 2015. Retrieved February 22, 2016. ^ Miller, Robyn. Classic Game Postmortem: Myst. Game Developers Conference Vault. UBM plc. Event occurs at 22'00"–25'00". Archived from the original on April 9, 2015. Retrieved February 22, 2016. ^ Gillen, Marilyn (July 9, 1994). "Interactive Gamers Try to Follow Enveloping 'Myst'". Billboard. 1: 100. ^ a b c d Parrish, Jeremy. "When SCUMM Ruled the Earth". 1UP.com. Archived from the original on February 29, 2016. Retrieved May 2, 2008. ^ Miller, Robyn. Classic Game Postmortem: Myst. Game Developers Conference Vault. UBM plc. Event occurs at 31'35"–33'40". Archived from the original on April 9, 2015. Retrieved February 22, 2016. ^ Miller, Robyn. Classic Game Postmortem: Myst. Game Developers Conference Vault. UBM plc. Event occurs at 33'41"–36'00". Archived from the original on April 9, 2015. Retrieved February 22, 2016. ^ Thomas, David (May 8, 1998). "Mastermind of Myst, Riven also has a talent for music". The Denver Post. ^ Sheridan, Tim. "Myst: The Sequel to Myst". AllMusic. Retrieved January 13, 2010. ^ a b "Myst for PC". GameRankings. CBS Interactive. Archived from the original on December 20, 2008. Retrieved December 11, 2018. ^ "Myst for DS". GameRankings. CBS Interactive. Archived from the original on December 20, 2008. Retrieved December 11, 2018. ^ "Myst for iOS (iPhone/iPad)". GameRankings. CBS Interactive. Retrieved December 11, 2018. ^ "Myst for DS Reviews". Metacritic. CBS Interactive. Retrieved December 11, 2018. ^ "Myst for PSP Reviews". Metacritic. CBS Interactive. Retrieved December 11, 2018. ^ "Myst for 3DS Reviews". Metacritic. CBS Interactive. Retrieved December 11, 2018. ^ a b Fournier, Heidi (May 20, 2002). "Myst: Review". Adventure Gamers. Archived from the original on December 13, 2014. Retrieved April 29, 2008. ^ a b "Myst Review (Mac)". Edge (4). Future plc. January 1994. p. 66. ^ a b c "Review Crew: Myst". Electronic Gaming Monthly. No. 71. Ziff Davis. June 1995. p. 40. ^ Staff (February 24, 1995). "New Games Cross Review - MYST". Weekly Famitsu (323): 37. ^ Staff (May 5, 1995). "PLAYSTATION CROSS REVIEW: MYST". Weekly Famicom Tsūshin (33): 23. ^ a b Sengstack, Jeff (May 1, 1996). "Myst for PC Review". GameSpot. Archived from the original on December 7, 2013. Retrieved April 27, 2014. ^ Dulin, Ron (December 1, 1996). "Myst Review". GameSpot. Retrieved February 10, 2018. ^ a b Watts, Martin (October 6, 2013). "Myst Review (3DS)". Nintendo Life. Retrieved February 10, 2018. ^ a b "Maximum Reviews: Myst". Maximum: The Video Game Magazine. No. 1. Emap International Limited. October 1995. p. 146. ^ a b "Maximum Reviews: Myst". Maximum: The Video Game Magazine. No. 4. Emap International Limited. 1996. p. 150. ^ a b "Missed". Next Generation. No. 6. Imagine Media. June 1995. p. 101. ^ a b "Myst". Next Generation. No. 25. Imagine Media. January 1997. p. 58. ^ a b "Myst". Next Generation. No. 8. Imagine Media. August 1995. p. 69. ^ a b Highfield, Vaughn (October 15, 2013). "A Myst Opportunity". Pocket Gamer. Retrieved February 10, 2018. ^ Breen, Christopher (December 1993). "A Spectacle Not To Be Myst". Computer Gaming World. pp. 114, 116. Archived from the original on March 19, 2016. Retrieved March 29, 2016. ^ Rothstein, Edward (December 4, 1994). "A New Art Form May Arise From the 'Myst'". The New York Times. Archived from the original on January 15, 2012. Retrieved March 12, 2008. ^ Daly, Steve (October 7, 1994). "The Land of 'Myst' Opportunity". Entertainment Weekly. Archived from the original on May 15, 2012. Retrieved May 2, 2008. ^ Pold, Søren. "Writing With the Code - a Digital Poetics". Aarhus University. Archived from the original on June 18, 2008. Retrieved April 15, 2008. ^ Evenson, Laura (December 22, 1994). "Interactive CD-ROMs come of age". San Francisco Chronicle. p. DAT36. ^ Beekman, George and Ben (March 1994). "Myst 1.0". Macworld: 76. ^ Levy, Steven (January 1995). "1994 Macintosh Game Hall of Fame". Macworld. 12 (1): 100–106. ^ Smith, Andy (March 1998). "Amiga Reviews Myst". Amiga Format (108): 35–37. Archived from the original on October 4, 2013. ^ "Crib Sheet". Next Generation. No. 23. Imagine Media. November 1996. p. 19. ^ a b "PC Retroview: Myst". IGN. August 1, 2000. Archived from the original on January 20, 2012. Retrieved April 21, 2008. ^ "Software Publishing Association Picks Codie Winners". Read.Me. Computer Gaming World. May 1994. p. 12. ^ Staff (March 1994). "The First Electronic Entertainment Editors' Choice Awards". Electronic Entertainment. 1 (3): 61–65. ^ Staff (June 1994). "Announcing the New Premier Awards". Computer Gaming World (119): 51–54, 56–58. ^ "The 15 Most Innovative Computer Games". Computer Gaming World. November 1996. p. 102. Archived from the original on April 8, 2016. Retrieved March 25, 2016. ^ a b "ProReview: Myst". GamePro. No. 81. IDG. June 1995. p. 80. ^ "ProReview: Myst". GamePro. No. 86. IDG. November 1995. p. 64. ^ "ProReview: Myst". GamePro. No. 92. IDG. May 1996. p. 60. ^ "ProReview: Myst". GamePro. No. 91. IDG. April 1996. p. 85. ^ GameSpot Staff (November 7, 2000). "The 15 Most Influential Games of All Time; Myst". GameSpot. p. 14. Archived from the original on May 25, 2005. ^ a b Walker, Trey (March 22, 2002). "The Sims overtakes Myst". GameSpot. Archived from the original on January 8, 2014. Retrieved April 27, 2014. ^ Manes, Stephen (November 4, 1997). "PERSONAL COMPUTERS; Riven Picks Up Where Best-Selling Myst Left Off". NY Times.com. ^ Morris, Chris (March 28, 2002). "Goodbye Myst. Hello Sims". CNN Money. ^ "NPD INTELECT: MYST FRANCHISE CONTINUES SUCCESS WITH MYST III: EXILE". IntelectMT. NPD. Archived from the original on December 15, 2002. Retrieved April 8, 2019. ^ Miller, Laura (November 6, 1997). "Riven Rapt". Salon. Salon Media Group. Archived from the original on April 2, 2008. Retrieved May 2, 2008. ^ a b c Edwards, Benj (September 24, 2018). "Myst at 25: How it changed gaming, created addicts, and made enemies". Fast Company. Archived from the original on October 1, 2018. Retrieved September 30, 2018. ^ "News Briefs: Halo rumors fly, Tribes 2 event on Saturday, and no TF2 at E3?". IGN. April 5, 2001. Retrieved May 3, 2008. ^ "New Myst III Trailer". IGN. May 2, 2001. Archived from the original on March 5, 2012. Retrieved April 12, 2008. ^ Castro, Juan (April 5, 2004). "Myst IV Announced". IGN. Archived from the original on May 16, 2012. Retrieved May 4, 2008. ^ Surrette, Tim (January 12, 2005). "Myst V landing on PCs this fall". GameSpot. Archived from the original on May 25, 2011. Retrieved May 1, 2008. ^ Calvert, Justin (November 14, 2003). "Uru: Ages Beyond Myst ships". GameSpot. Archived from the original on March 9, 2013. Retrieved April 19, 2008. ^ Onyett, Charlie (February 4, 2008). "Myst Online: Uru Live is Discontinued". IGN. Archived from the original on October 26, 2012. Retrieved April 9, 2008. ^ Chalk, Andy (April 7, 2011). "Open Source Myst Online Finally Happens". The Escapist. Defy Media. Archived from the original on March 14, 2012. Retrieved March 11, 2016. ^ "New and Expanded Features Revealed for Highly-Anticipated Uru: Ages Beyond 'Myst'" (Press release). Business Wire. May 7, 2003. Archived from the original on March 2, 2009. Retrieved April 27, 2014. ^ Guilofil, Michael (May 22, 2001). "Beyond the Myst". The Spokesman-Review. Archived from the original on November 2, 2013. ^ Suellentrop, Chris (March 3, 2013). "A Museum's Games Are Not on Pedestals". The New York Times. Archived from the original on November 6, 2015. ^ Basner, David (May 4, 2000). "The Simpsons as Fart, D'oh!, Art". The Simpsons Archive. Archived from the original on July 2, 2014. Retrieved April 1, 2008. ^ Klepek, Patrick (April 29, 2008). "Update: Matt Damon Didn't Speak Directly To 'Bourne' Developers, Wanted A Game Like 'Myst'". MTV. Archived from the original on September 13, 2015. Retrieved May 2, 2008. ^ Twist, Jo (August 25, 2005). "Pupils learn through Myst game". BBC. Archived from the original on March 5, 2016. Retrieved May 3, 2008. ^ Kirsh SJ (1998). "Seeing the world through Mortal Kombat-colored glasses: violent video games and the development of a short-term hostile attribution bias". Childhood. 5 (5): 177–184. doi:10.1177/0907568298005002005. ^ Eng, Paul M (October 12, 1996). "Myst Gets Dissed on CD-ROM". BusinessWeek. ^ Abad-Santos, Alex (October 26, 2016). "The strange appeal of escape the room games, explained". Vox. Retrieved October 29, 2018. ^ Andreeva, Nellie (May 6, 2015). "Hulu Lands 'Myst' Drama From Legendary TV & Matt Tolmach Based On Video Game". Deadline Hollywood. Archived from the original on February 21, 2016. Retrieved May 6, 2015. ^ "Next Wave - Sega CD - Myst (Sunsoft)". EGM2. No. 2. Sendai Publishing. August 1994. p. 59. ^ "Next Wave - Sega CD - Myst (Sunsoft)". EGM2. No. 5. Sendai Publishing. November 1994. p. 74. ^ "Myst: Masterpiece Edition". Ubisoft. 2000. Archived from the original on March 17, 2008. Retrieved May 2, 2008. ^ a b c Walker, Trey (October 20, 2000). "Real Myst Shipping in Early November". GameSpot. Archived from the original on May 25, 2011. Retrieved May 7, 2008. ^ P., Wolf, Mark J. (2011). Myst and Riven : the world of the D'Ni. Ann, Arbor, MI: University of Michigan Press. ISBN 0472027492. OCLC 744519795. ^ "realMYST - MYSTAges". www.mystwiki.com. Retrieved February 17, 2019. ^ "RealMyst Review". IGN. November 13, 2000. Archived from the original on March 8, 2016. Retrieved April 29, 2008. ^ retro GAMER Collection Volume Five. Bournemouth, UK: Imagine Publishing. 2011. p. 130. ISBN 978-1-908222-09-1. ^ "realMyst: Masterpiece Edition". Steam. Valve Corporation. Archived from the original on February 7, 2014. Retrieved February 8, 2014. ^ Meer, Alec (February 7, 2014). "Gouraud Shading In The Myst: Myst Remake Gets Remade". Rock, Paper, Shotgun. Archived from the original on June 29, 2015. Retrieved February 8, 2014. ^ "realMyst: Masterpiece Edition v2.0 released!". Steam Community. Cyan, Inc. January 28, 2015. Archived from the original on October 18, 2016. Retrieved October 16, 2016. ^ "Myst, A PS One Classic Adventure Game For The PS3™ & PSP® System - PlayStation®". Us.playstation.com. May 15, 2012. Archived from the original on February 8, 2013. Retrieved August 13, 2012. ^ "Myst Set for PSP". IGN. November 22, 2005. Archived from the original on March 16, 2006. Retrieved March 29, 2006. ^ "Myst (PSP)". IGN. Archived from the original on February 4, 2012. Retrieved April 27, 2014. ^ Purchese, Rob (June 7, 2007). "Myst heads to DS". Eurogamer. Archived from the original on June 25, 2007. Retrieved June 7, 2007. ^ "Myst (ds: 2007): Reviews". Metacritic. Retrieved May 1, 2009. ^ Whitehead, Thomas (November 15, 2012). "Nintendo Download: 15th November 2012 (North America)". Nintendo Life. Archived from the original on November 18, 2012. Retrieved November 15, 2012. ^ Whitehead, Thomas (September 2, 2013). "Nintendo Download: 5th September (Europe)". Nintendo Life. Archived from the original on September 4, 2013. Retrieved September 3, 2013. ^ "Myst for PocketPC". Archived from the original on December 13, 2012. Retrieved April 27, 2014. ^ "Riven for PocketPC". Archived from the original on October 30, 2012. Retrieved April 27, 2014. ^ Cohen, Peter (August 18, 2008). "Myst coming to iPhone". Macworld. Archived from the original on August 30, 2008. Retrieved August 26, 2008. ^ "Cyan's 'Myst' for iPhone Brings Back Memories". touchArcade. May 2, 2009. Archived from the original on April 18, 2011. Retrieved May 4, 2009. ^ Williams, Bryn (May 4, 2009). "Massive Myst Clogs Up iPhone". GameSpy. Archived from the original on February 3, 2013. Retrieved April 27, 2014. ^ "realMyst for iPad - Now Available!". Cyan Worlds. June 14, 2012. Archived from the original on June 1, 2013. Retrieved August 7, 2012. ^ Webster, Andrew (January 26, 2017). "Iconic adventure game Myst debuts on Android today". The Verge. Archived from the original on January 26, 2017. Retrieved January 26, 2017. ^ Takahashi, Dean (April 26, 2017). "Classic game Riven follows Myst onto Android smartphones". VentureBeat. Archived from the original on April 27, 2017. Retrieved September 4, 2017. This page was last edited on 8 April 2019, at 10:56 (UTC).